Lately, I've been day-dreaming about which poems to use in my summer Poetry Writing for Kids workshop. It's a fun, but difficult exercise...kind of like having to pick out just a few pieces of candy out of a blimp-sized bag of tasty treats. Though my class is geared toward 3rd-5th graders, I'm the kind that doesn't like to narrow the field to "children's poetry" (although there is plenty to choose from there.) So when I started thinking about a nature-inspired unit, my thoughts drifted immediately to Mary Oliver. 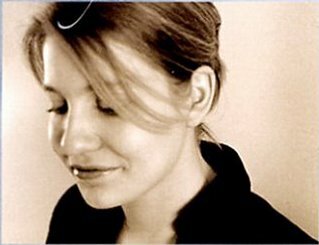 Her simple, elegant, sharply observant, and sparse poems are filled with exactly the kind of wonder and beauty I am hoping my students will tune in to. 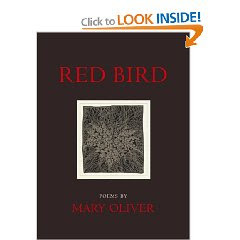 Over Easter, I picked up Mary Oliver's 2008 collection, Red Bird. (Her newest collection, Evidence, is scheduled to hit bookstores this month.) As expected, it is filled with rich images from the natural world that plant themselves in your mind and stay with you all day. The poet Stanley Kunitz has wisely said, "Mary Oliver's poetry is fine and deep; it reads like a blessing." Below is one of the poems on this topic that I intend to use for my class. I hope you'll have a chance to pick up a copy of Red Bird and read the rest. It is indeed fine and deep and reads like a blessing. He puts his face over the top of it and moans. The tide is out and the neighbor's dogs are playing. But Percy, I say. Ideas! The elegance of language! Books? says Percy. I ate one once, and it was enough. Mary Oliver's biography is available at Poetry Foundation.